Keep the water in your pond moving well with the Cal Pump PWM5200 Waterfall Pump and Prefilter. This magnetic drive pump provides an energy efficient way to move the water in your pond, for a fantastic look and sound. This pump is made to run continuously, without any oil or seals, and has only one moving part, a shaft with impeller. This design eradicates the danger of oil leaking into the pond, for safe operation even around your fish or aquatic plants. Using less energy than their direct drive counterparts, magnetic drive pumps can often save enough money in energy to pay for themselves in just one season. This unit's durable construction, corrosion resistance, and energy efficiency make it an integral part of your pond system season after season. The sound and vision of a waterfall cascading down rocks into a pond or stream enhances a pond in a way no other feature can. This Cal Pump Magnetic Drive Waterfall Pump is ideally suited for creating a waterfall, which benefits your pond by oxygenating the water as it returns to the basin. This pump features a 0.33 Hp, magnetic drive motor capable of turning 4080 gph at 1 foot of head height, and easily accepts a male 1.5" NPT threaded fitting for straightforward plumbing. Add the included Cal Pump Plastic Prefilter Screen to the pump's inlet, elevating the unit from the bottom of the water feature and protecting it from debris. 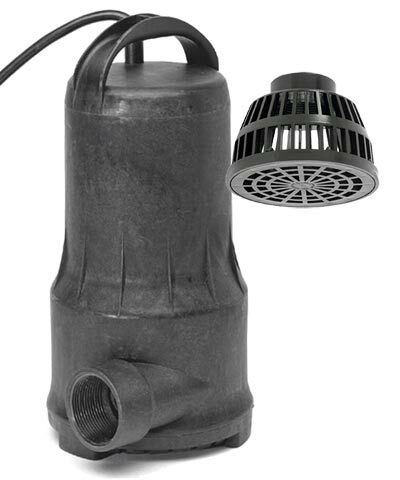 This hardy pump is perfect for powering a waterfall, biofilter, or stream in your backyard water feature. Ensure the water in your pond moves easily with this PWM5200 Waterfall Pump and Prefilter.